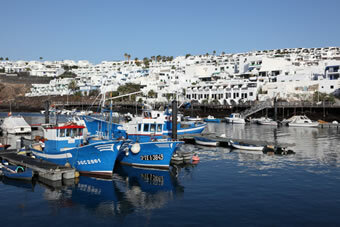 Puerto del Carmen is the main resort on Lanzarote and the second largest conurbation on the island after the capital of Arrecife. It is centrally located close to the airport, which keeps transfer times to a minimum and which also makes it a great base for exploring the island. Up until the advent of mass market tourism in the late 1960s Puerto del Carmen was just a small fishing village known locally as La Tiñosa. It's sheltered aspect and sandy beaches however made it a prime candidate for commercialisation and the first visitors to Lanzarote stayed in the Los Fariones Hotel which is located close to the Old Town harbour area and which first opened for business back in 1967. The resort is often said to have two halves, the Old Town and the New. But they look much alike and any differences between the two would be indiscernible to visitors. The Old Town area is however home to most of the best villas in Puerto del Carmen, so this is worth noting if you are planning on booking self catering accommodation here. The main beaches in the resort are however located off the Avenida de las Playas (known locally as the Strip) in the New Town. Much of Puerto del Carmen's popularity as a holiday resort is obviously attributable to the fact that it boasts a number of excellent beaches. On the outskirts, as you drive in from the airport you first come across Playa Los Pocillos, which is a huge 3km long beach which is best enjoyed on days when there is little wind, as these are the most exposed sands in the resort. Driving through the resort along the Avenida de las Playas visitors will then find a number of much smaller little beaches to their left, most of which are hidden away behind the shops and bars on the sea front side of the road. These are great little finds, especially when the tide is out and very popular with the locals. Further along the Avenida, before the Los Fariones Hotel, you'll then encounter the main beach in the resort, the aptly named Playa Grande. This is the spot to head for if you are travelling with kids as there are amenities here such as WCs and sun loungers and access to the sea is safe and easy, making it ideal for bathing. Just past the Los Fariones hotel lies the much smaller beach of Playa Chica, which is another locals favourite and a popular spot with diving enthusiasts. Especially those just learning to dive as giant rocks form a man made sea wall. Puerto del Carmen is home to one of just two golf courses on Lanzarote. 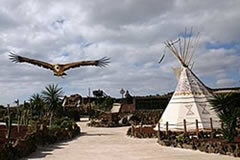 There is also a decent Wild West theme park which is perfect for kids, called Rancho Texas which is worth a visit. They conduct various shows throughout the day featuring sea lions and parrots and also have a zoo, which is home to a wide array of animals including white tigers. Alternatively head for the Old Town harbour and take a boat trip along the shoreline or over to the neighbouring island of Fuerteventura. Puerto del Carmen is home to hundreds of restaurants but many rely more on their location than on their cuisine to attract custom. So it pays to do a little research. The Old Town harbour area is a good place to dine out, not least as it is quite atmospheric and is also home to a number of good sea food restaurants, such as Puerto Bahia and Casa Roja. You can't miss Casa Roja either as it is situated in a red house (as the name suggests) right by the seafront. Just a behind the harbour you can also find other local favourites such as Bozenas, which serves an eclectic mix of Spanish and Polish food. If you're looking for something really upmarket then Las Arenas in Los Mojones is a chi chi little joint with prices to match. Whilst at the budget end of the market there are loads of very competitively priced Indian and Chinese restaurants in the New Town.